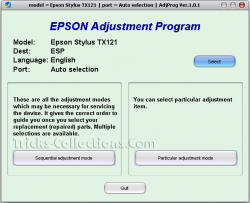 After wait for a long time, finally resetter Epson T13, TX121 and T1100 available on internet. I found the resetter Epson T1100 on indoreset whereas resetter Epson T13 and TX121 on mediafire uploaded by OrTHoTaMiNe. I’ve tried to run all software resetter on my computer and all software resetter not crash with antivirus installed on my computer (I use AVG) except resetter Epson T13. AVG antivirus detected Epson T23 resetter as Virus. Maybe it caused this software has cracked but I think it not problem, you can disable the antivirus protection on your computer when you want to use this software to reset your Epson printer. Related to "Resetter Epson TX121, T13, T1100"
a lot of thanks to orthotamine…. tx121 is working fine!!! 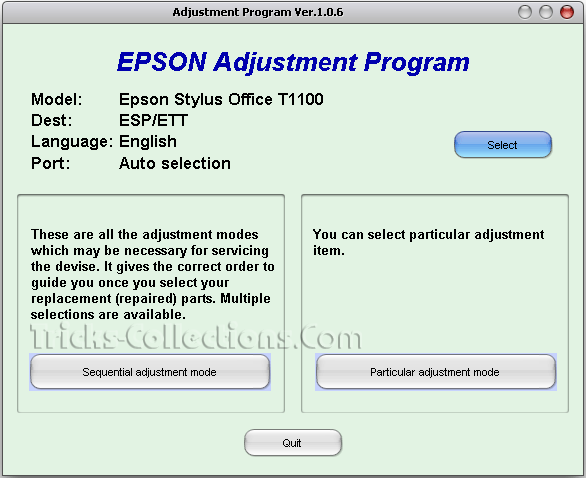 yahoo i can use again my epson t13,,, thanks a lot !!! mr OrTHoTaMiNe. i am very thankfull to you. I reset epson t13 tx 121 and t60 printer. your tx121 reseter is looking so good. it’s looking like as “SHAHENSHA”. Thank you very much for epson t13 restter. it works really fine! can anybody help me out to reset the ink counter ! thank you very much for the contribution it actually works. thank you very much , my epson t13 already reset thanks for the help. printer Epson T13 cannot print… message said “General Error, delete printing and remove any foreign object inside” … i keep checking and found no any foreign object inside printer… can any body help me resolve the problem…. Can the T13 Resetter solve my problem???? I tried this Software many times for my T13 .It never worked. After accepting the licence.the screen comes to select the printer.Click 100 times on the select button no use.the screen keeps mum. my t13 is completely dead. the buttons LED are lighting. when i tried to replace the cartridge using the maintenance tab, it simply move but it never recharge. then the buttons are not working. whenever i plug in the cable in the outlet, it automatically power up. anyone can help me with this? thanks in advance. printer Epson T13 cannot print… message said “General Error, delete printing and remove any foreign object inside” … i keep checking and found no any foreign object inside printer… can any body help me resolve the problem….and i download resetter and run it..nothing happen..same problem general error..plz..help..how can i solve this problem? 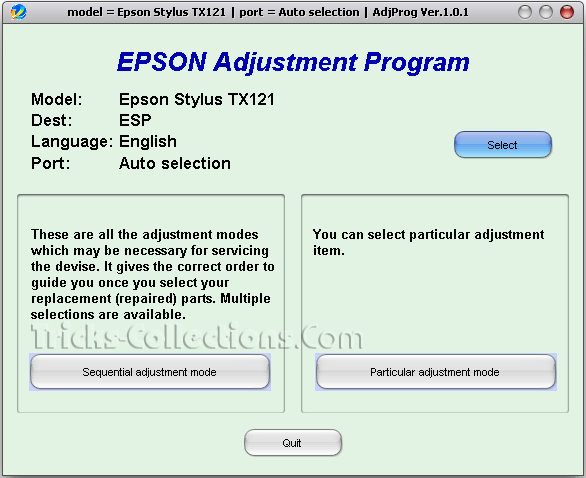 thank you for the resetter… i already reset my tx121 epson..
i cant open the download file for the resetter of epson t13.. any one can help me how to open and reset my epson t13.. thanks. thank you so much…it works again my t13…God Bless you always…. TX121 stylus epson cannot be recognize cartrige can you help my prob. Epson stylus TX121, other ink cartridge hard to recognize like cyan and yellow. pls help me. thanks! i have an epson t13 with cis and there seem to be a problem with the paper feeder. it always flashes an error with loading the paper. and i can hear noises like gears gnashing. please help…. my printer is damage. massage in the box status window “ink out error”. how to make it normally? i have an epson t13, now i get a problem with ink out catridge. please help me, how to make normally with your programs. thanks. @saifun, Are you use original Epson cartridges in you printer? or you’ve applied CISS in your Epson printer. If you use original Epson cartridge I think the solution is replace the cartridge with new one. If you are use CISS in your printer, usually there button near of the cartridge. Push the button to reset ink level of the printer. I have epson stylus t13 and the problems is printing double letters. Please help me to overcome this problem. Please me, Epson TX121 printer is General Error problem . why? It is hardware error?. or firmware error? thanks a lot, this does not give me any hassle in downloading. it works. I cannot try Epson TX121 and Epson 13 ‘s General Error. opeing Error Lamps 2.